George is the Robert L. Rooke Professor of Statistics at Mt. Holyoke College, where he served a three-year term as Dean of Studies. He received his Ph.D. in statistics from Harvard and is an expert in statistics education with a significant publication record. He chaired the joint committee on undergraduate statistics of the Mathematical Association of America and the American Statistical Association and is a Fellow of the American Statistical Association. he also led the Statistical Thinking and Teaching Statistics project of the Mathematical Association of America, which helped professors of mathematics learn to teach statistics. Over the past two decades, Dr. Cobb has frequently served as an expert witness in lawsuits involving alleged employment discrimination. Richard is Professor Emeritus of Statistics at the University of Florida, where he served as chairman of the Department of statistics for 12 years. He received his Ph.D. in statistics from Florida State University. Dr. Scheaffer's resereach interests are in the areas of sampling and applid probability, especially in their applications to industrial processes. He has published numerous papers and is co-author of four college-level textbooks. 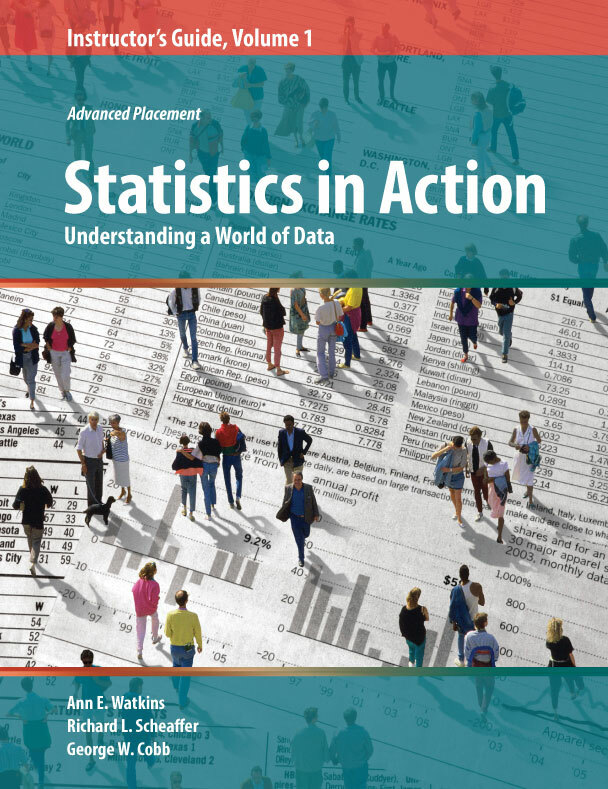 Much of his effort has been directed toward statistics education at the elementary, secondary, and college levels. He was one of the developers of the Quantitative Literacy Project where he helped form the basis of the data analysis emphasis in mathematics curriculum standards recommended by the Natiional Council of Teachers of Mathematics. Dr. Scheaffer has also directed the task force that developed the AP Statistics Program and served as its first Chief Faculty Consultant. Dr. Scheaffer is Fellow and past president of the American Statistical Association, from which he received a Founders Award. Ann is Professor of Mathematics at California State university, Northridge. She received her Ph.D. in education from the University of California, Los Angeles. She is a former president of the Mathematical Association of America and a Fellow of the American Statistical Association. Dr. Watkins has served as co-editor of College Mathematics Journal, as a member of the Board of Editors of American Mathematical Monthly, and as Chair of the Advanced Placement Statistics Development Committee. She was selected as the 1994-95 CSUN Outstanding Professor and won the 1997 CSUN Award for Advancement of Teaching Effectiveness. Before moving to CSUN in 1990, she taught for the Los Angeles Unified School District and at Pierce College in Los Angeles. In addition to numerous journal articles, she is the co-author of books based on the work produced by the Activity-Based Statistics Project, the Quantitative Lieteracy Project, and the Core-Plus Mathematics Project.